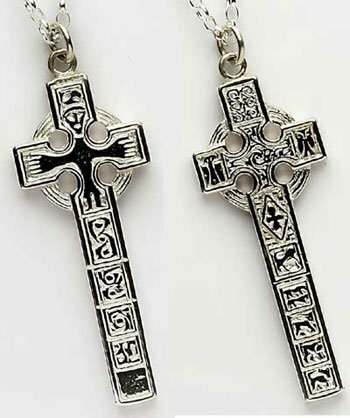 Replica cross pendant of the Celtic cross of Moone in silver and gold. Beautiful Celtic Cross Pendant faithfully handmade in sterling silver or gold captures in authentic detail of the original Celtic cross of Moone. 38mm high and 18mm wide. Silver weight 5.2g. Gold weight 6.3g. With 18 inch chain. Handmade and hallmarked in Ireland. This is a double-sided replica of the original cross. At Moone in Co.Kildare, is the site of the early Columban foundation – “Moin Cholum Cille”. Here you can see the tall slender Celtic Cross at Monasterboice which are standing where the monks placed them, the cross of Moone was lost for centuries, buried and in pieces. The capstone of the cross is still missing. The story of the finding of the cross is interesting. In the middle of the nineteenth century, just after the Great Famine, a local mason was taking slabs of stone from the ruins if the Abbey for building purposes when he unearthed the base and head of the cross. He and others in the locality recognised its importance and some later the base and head were set up near the place it was found at the south east of the ruined Abbey Church. Some years later, when some other workmen were digging a grave in the grounds of the ruin, the shaft of the cross was uncovered. Later still, in the 1893, the pieces were skillfully put together by three brothers of the O’Shaughnessy family, the sons of the Micheal O’Shaughnessy who first found parts of the cross forty years before and who had lived to see the completed cross erected. The bill for the work is still extant – its total £8.07s. of which £5 was contributed by the Kildare Archeological Society and the balance by Mr.F.M. Carrol of Moone Abbey House. The cross itself is probabaly early 9th Century. It appears to be in the tradition of the “midland” group of crosses, the prototypes of the greater crosses carved and erected in the Northern Province in the later part of the ninth and early tenth centuries. It has the ringed head which we all associate with the Celtic crosses, in the Crucifixion scene on the base, the figure is draped but, unusually, the spear is shown piercing Our Lord’s right side. The cross, which is made of granite probably from Castledermot – also has intricate Celtic designs, both curvilinear and geometric, as well as human figures, though these latter are rough hewn and stylised. However, scholars say that it is the first cross on which the scenes from the Old Testament occur in a regular programme, an important development in the history of the Irish High Crosses.